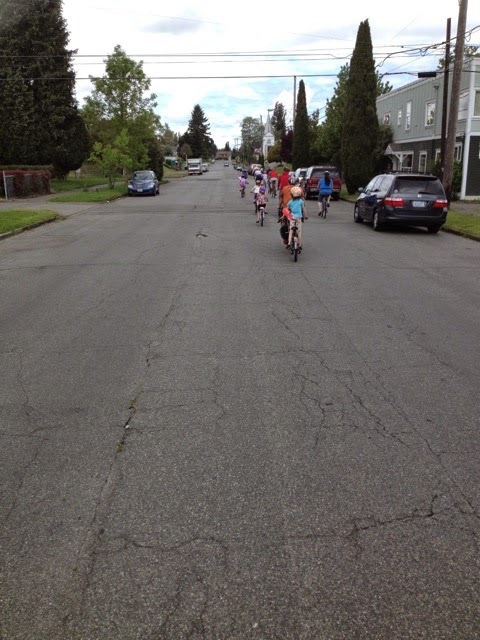 May is Bike Month and there are many bikey activities planned in the Tacoma area. 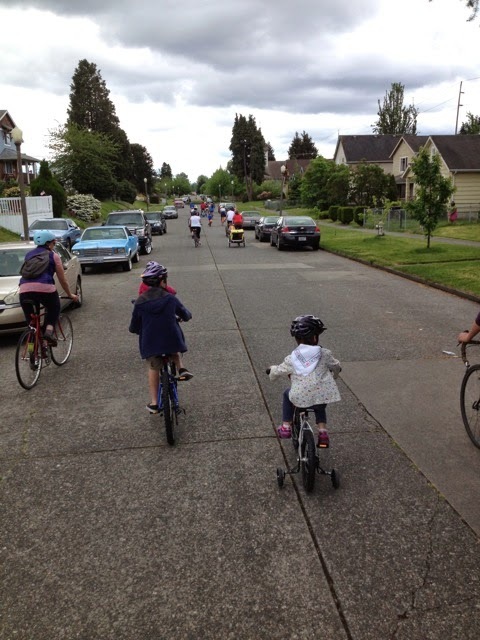 Kidical Mass will join in the fun on May 17 with a ride through the Hilltop neighborhood. 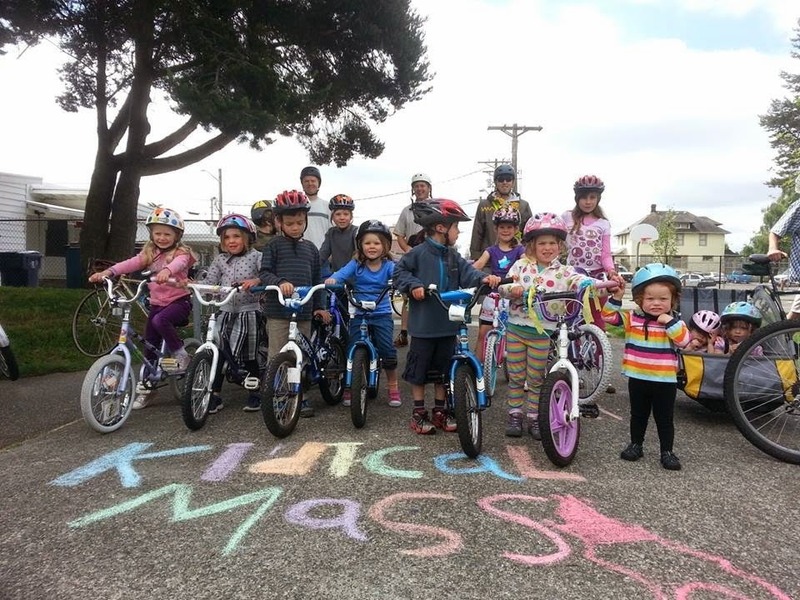 Kidical Mass is a bike ride for families, giving kids and parents an opportunity to ride in the street together safely and lawfully. 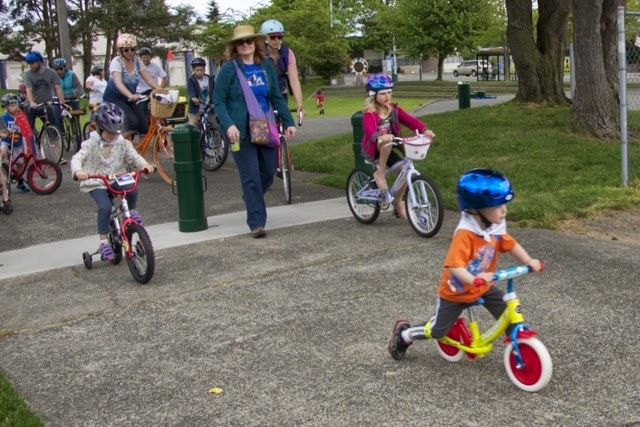 Tacoma has a helmet law, so helmets are required for all riders - including parents. Rides are typically 3-4 miles roundtrip with a stop in the middle to play. 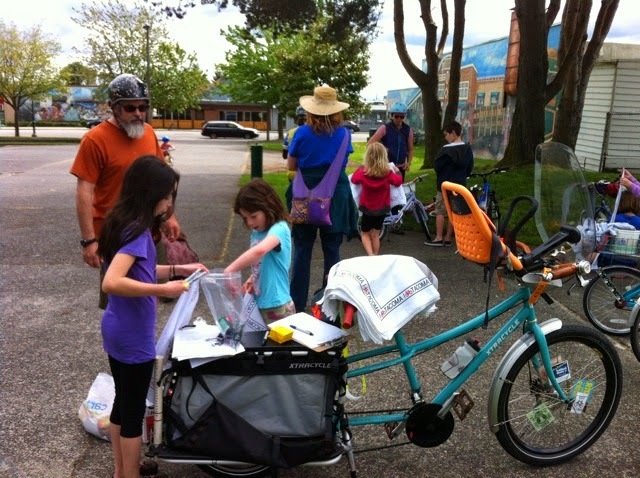 Bikes with wheels smaller than 16" and bikes with training wheels are not recommended, but feel free to bring younger riders along with kid seats, cargobikes, trailers and trail-a-bikes. 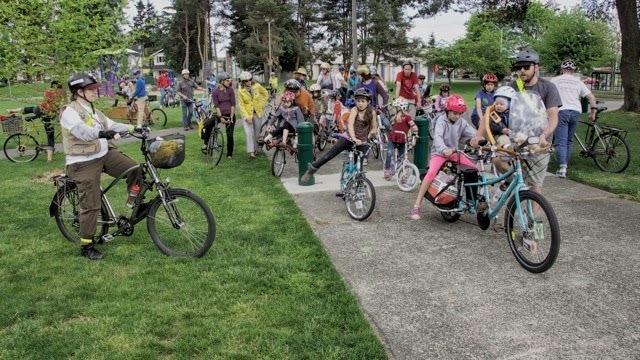 For this ride, we'll meet at Peoples Park (South 9th and Martin Luther King Jr Way) between 10-11am on Saturday, May 17. 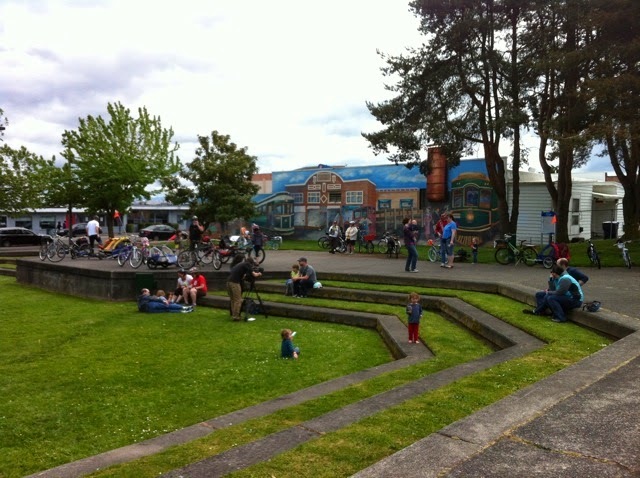 There's a great playground here and we'll have some supplies on-hand for decorating and personalizing your bike. 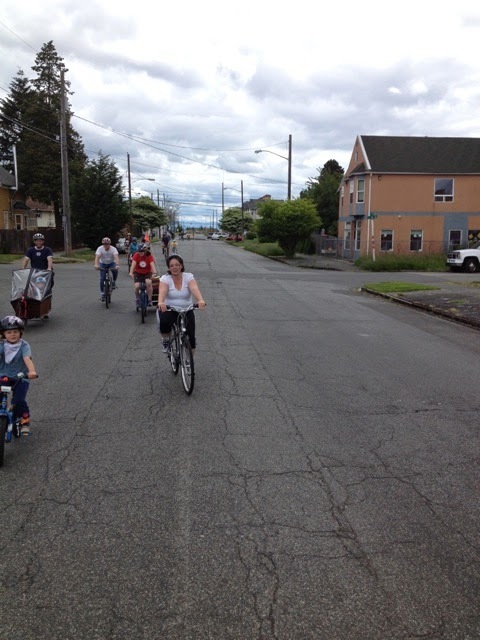 We will roll out at 11am on our way to McCarver Elementary and Zina Linnik Park, a 1.8 mile route. 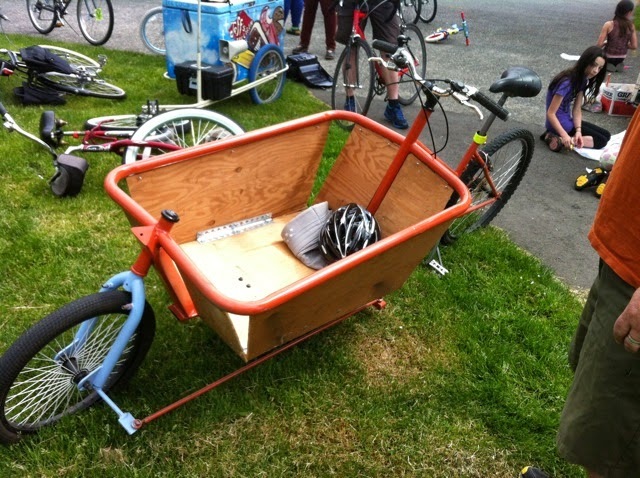 The pace will be rather slow (about 4-5mph) so that a rider on a 16" wheeled bike can stay with the group. We'll hang out at McCarver for 20 minutes or so before heading back to Peoples Park for a free snack. The return route will be more direct and we'll decide from a few options based on how comfortable riders are with traffic. 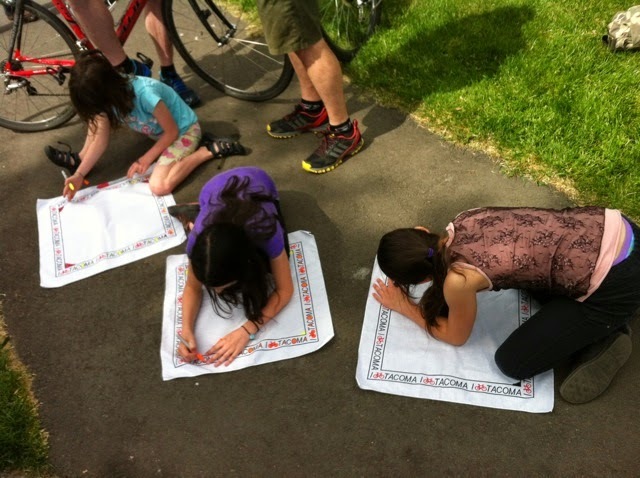 We should be back at Peoples Park around noon, so feel free to pack a lunch and have a picnic if the weather is nice. We'll still ride in a drizzle, but extreme rain will cancel. Questions? Feedback? Are you planning to attend? Ideas to make this more awesome? Please post comments or email kidicalmasstacoma(at)gmail(dot)com. What a great turn-out! 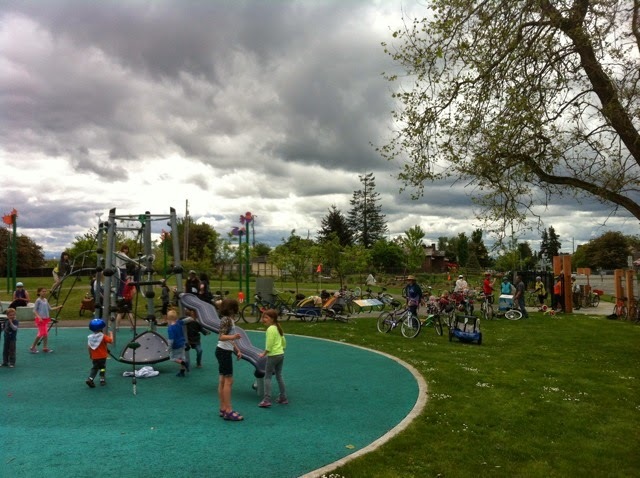 The skies parted just in time for us to meet at People's Park. 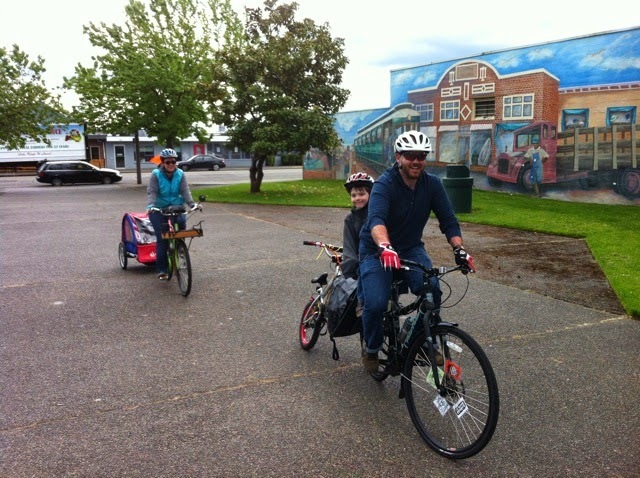 The kids and parents mingled, decorating bikes and finding lots of creative ways to personalize those I Bike Tacoma bandanas. 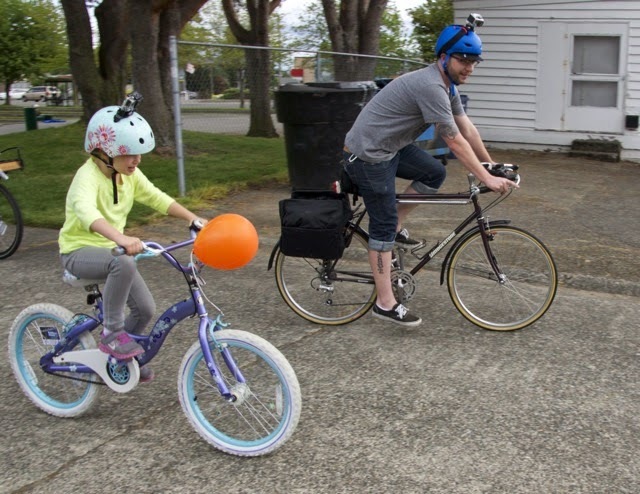 TV Tacoma was there to capture the chaos for an upcoming segment on their new Urban Green program (can you spot the helmet cams?) and a reporter from The News Tribune finally rode along as well. 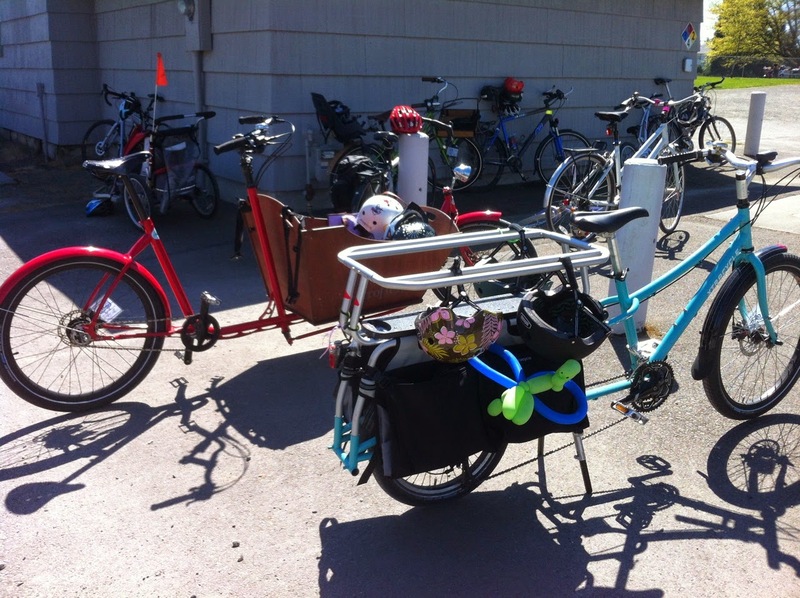 There were box bikes, recumbent tandems, trail-a-bikes, kid seats, long-tails, mid-tails, and a few young and determined riders on push bikes and training wheels bringing up the rear. 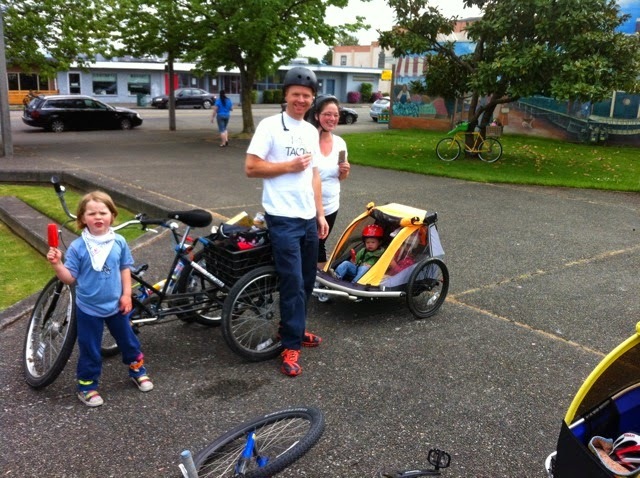 We even picked up another father and daughter pair of riders as we reached McCarver Elementary. And no rain! I lost track of how many Little Free Libraries we spotted along the way; at least two but I think the kids saw one that I didn't. 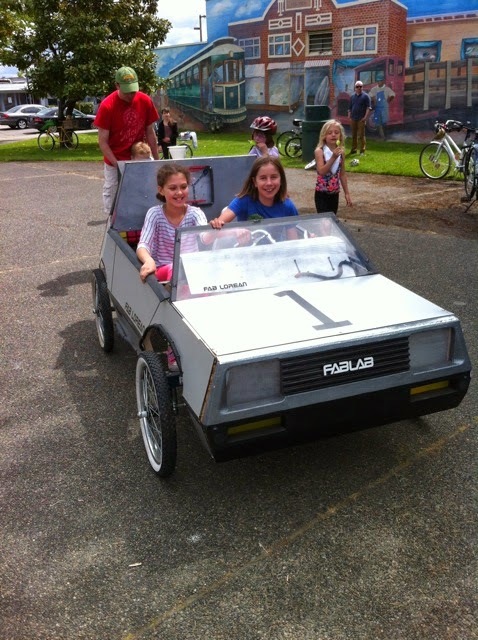 FabLab Tacoma surprised the kids by rolling their FabLorean pedal car to People's Park so the kids could take their one-of-a-kind time-machine for a spin. Thanks Billy! It was just a great day. 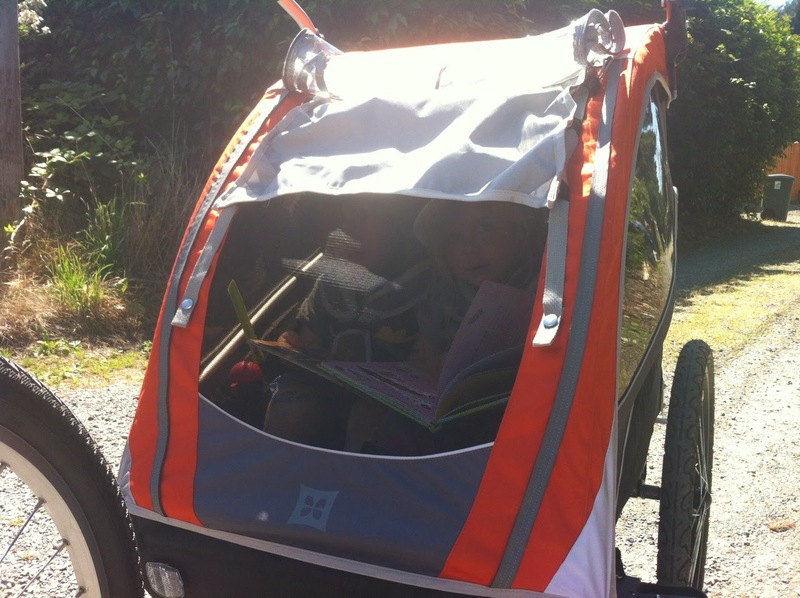 There were a few minor mechanical issues with a few kids' bike, but we had no problems navigating Hilltop by bicycle. 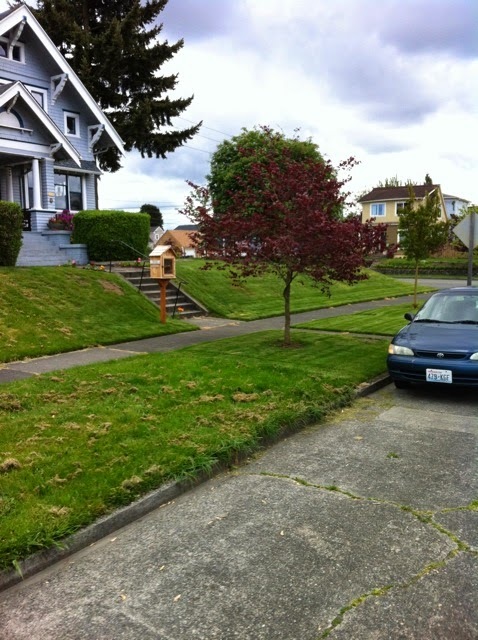 I'd say Hilltop is actually the most bike-friendly neighborhood in Tacoma. 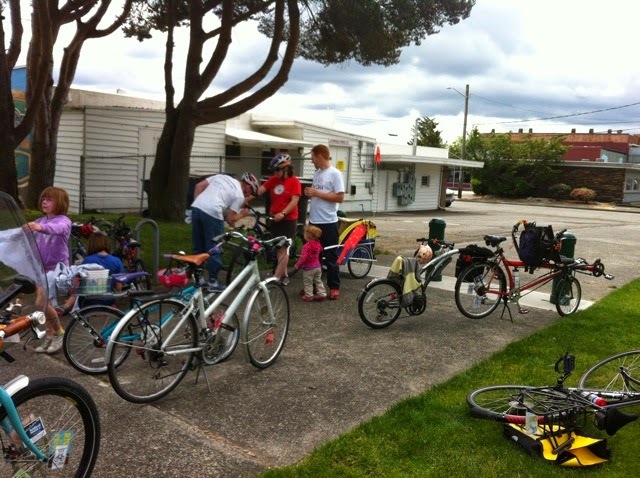 Thanks again to the Tacoma Wheelmen's Bicycle Club for sponsoring the ride, to Jeff's Ice Cream for bringing along frozen treats for everyone, to Carla Gramlich for taking photos, and to riders from VeloFemmes and TWBC that came along to help out. 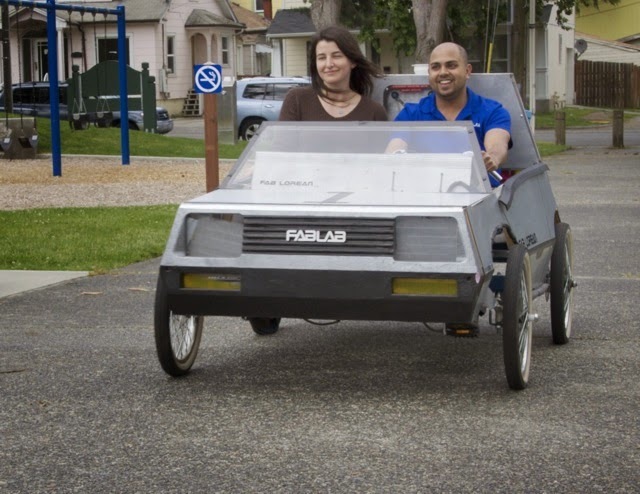 We'll see you on another ride in the future!